The First & Third Tuesday of each month, 8:00 AM breakfast, 8:30 AM mtg. 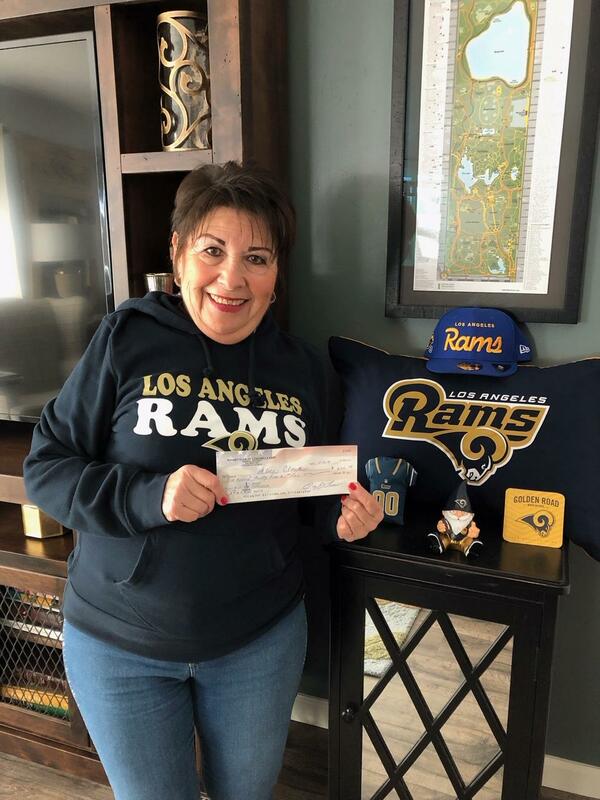 Alice Cloud had the winning numbers for the score at the end of two quarters of the Super Bowl pool and happily displays the winning's check presented to her. Although her Rams came out short on their pursuit of the title, her smile indicates that she was nontheless a big winner!! Thanks for your support, Alice, of our fund raising event. Ian Castro is joined by newly inducted members Kris Gonzales and Charlotte Hermosillo. Our club has added five new members recently and we all join in welcoming them to the Rotary family. New community projects are in the works and we are again looking forward to being of service to our communities. SERVICE ABOVE SELF! President Rudy Alegria inducts new member Ian Castro at our October regular meeting. Ian will bring energy and enthusiasm, plus internet savvy, to our club. Welcome, Ian!! Outgoing President George Jones and incoming President Rudy Alegria welcome new members Gil Gonzales and Fred Hermosillo. "The Taco Takeoff Fiesta" was held July 1st at the Las Casuelas Restaurant in Rancho Mirage for the purpose of welcoming incoming District Governor Ricardo "Taco" Loretta. 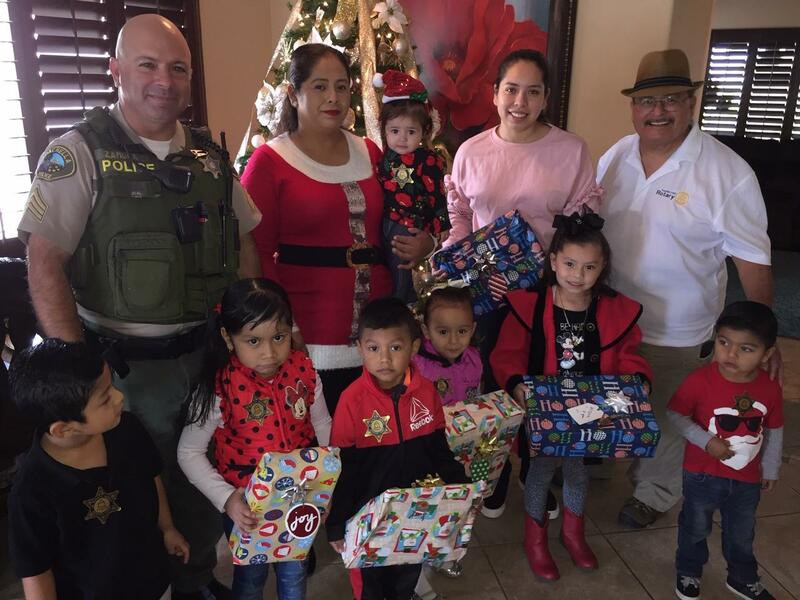 Our club was represented by members George Jones and Tony Lucero, and guests Gil Gonzales and wife Chris, and Fred Hermosillo and wife Charlotte. Members and guests came together at the Clubhouse for a "demotion party" (roast) for outgoing President George Jones and the welcoming of new President Rudy Alegria. Entertainment was provided by member Vern Howell who displayed his talent in singing a variety of country and western songs. 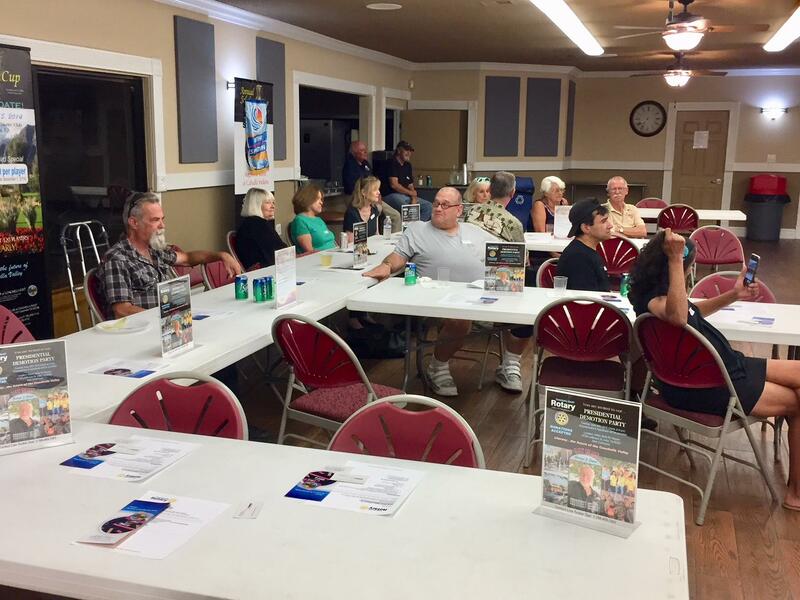 Dinner was provided thanks to the efforts of member Lisa Isbell. The evening ended with the "passing of the gavel" from George to Rudy. Ice Cream at the Movies! Our club volunteers again partnered with the city of Coachella in providing snacks for kids during the city's Movies at the Park summer program. Ice cream bars were provided to over 120 youngsters during the event. Bobby Duke Middle School students head to Chicago! On May 8, 2018 thirty one students from Bobby Duke Middle School in Coachella will travel to Chicago to compete in the national KidWind renewable energy project. Teachers Edwin De Toya and Carly Mahoney worked tirelessly to prepare these students and make this trip possible. It took the community to financially support this trip, and our club is proud to have been part of this effort. Our club participated in the annual Math Day event sponsored by a neighboring rotary club at John Glenn Middle School in Indio on April 28, 2018. The city of Coachella was represented by a team from Bobby Duke Middle School. Coachella East Rotary Club is hosting its 4th Annual Scholarship Cup golf fund raising tournament on September 16, 2013 at the Mountain View Country Club. It is another opportunity for golf players to play on a private golf course. All funds raised from the golf tournament will be use to help our local community students to better their education. The Club is hosting its 2013 Gala at the Spotlight 29 Casino. There will be entertainment, dancing, and dinner for all guests with reservations. Please help the Coachella East Rotary Club (CERC) on it fund raising event, all proceedings will help our East Valley students to better their education. The event will take place on March 16, 2013 from 6pm to 10:30pm. For more details and reservations please click on '2013 Gala - Guest Flyer' and/or '2013 Gala - Sponsor Flyer' under the "Download" section on out Homepage. Coachella East Rotary Club is hosting its 3rd Annual Scholarship Cup golf fund raising tournament on September 24, 2012 at the Mountain View Country Club. It is another opportunity for golf players to play on a private golf course. All funds raised from the golf tournament will be use to help our local community students to better their education. Coachella’s Rotary Club, Boxing Club, Boys/Girls Club, and city employees got together on Saturday April 28th to remove the graffiti found allover the Bagdouma Park. It was a great team effort of teens and adults to make our local park a safe and fun recreational place for our community. We thank all participants for their time and hope that their efforts don’t go unnoticed. The Esperanza Youth and Family Center is having a "Ashley Mendoza" benefit Fundraiser carwash on April 14th from 8am to 12pm. Tickets may be purchased at the Esperanza Youth and Family Center located at 1536 7th Street in Coachella. For more information please call (760) 398-0711. Carwash ticket are ($5 cars / $7 SUVs).